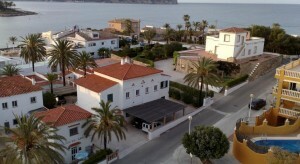 Privately owned Rental property in the Javea area of The Costa Blanca Spain. Arenal beach Javea on the Costa Blanca is a shell shaped bay with golden sands ideal for families, and visitors of all ages. It is the most popular beach in Javea. With it´s shell shaped bay, golden sands and shallow clear water, There is something for everybody. Swings, climbing frames,and slides for the children, volley ball nets and water sports for the energetic, or laze in the sunbed ,or stroll along the promenade. Each air-conditioned bungalow has a seating area with TV, a full kitchen with microwave and a private bathroom. Bed linen and a washing machine are included. Guests are requested to bring their own towels. This self-catering accommodation offers free parking. The property is 10 minutes’ drive from the entrance to El Montgó Nature Reserve. Alicante Airport is located 98 km away. Featuring a private swimming pool and a garden with sun loungers, Adsubia 20 is located in Jávea. The holiday home is only 10 minutes’ walk from Arenal Beach. The house features a lounge with a flat-screen TV and DVD player. The kitchen is equipped with a dishwasher, oven and microwave. There are 3 bathrooms. The property has various terraces. One of them is covered and includes BBQ facilities and a dining table. Guests have free internet access. There is also a private parking. A wide variety of bars and restaurants can be found within 10 minutes’ walk. Guests can also visit several beaches and coves less than 5 minutes’ drive from the property. Jávea Golf Club is 5 km away. This air-conditioned apartment has 3 bedrooms, 2 bathrooms, and a seating area with TV. There is a full kitchen with an oven, a dishwasher and a microwave. You can enjoy pool view from the apartment. You can walk to the beach, shops and restaurants in about 5 minutes. You can drive to Denia in 15 minutes, and Calpe is about 30 mintues away. Villas Bramms This property has agreed to be part of our Preferred Property programme which groups together properties that stand out thanks to their excellent service and quality/price ratio with competitive prices. Participation in the programme requires meeting a specific set of criteria and takes into account feedback from previous guests. 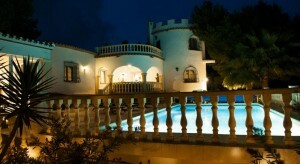 JáveaFeaturing a private swimming pool, garden, and a sun terrace, Villas Bramms is located in Javea. It offers spacious villas with a barbecue and shared spa facilities. Free WiFi is available. All properties include a large living area with a sofa set and a flat-screen TV with satellite channels, while the well-equipped kitchen comes with an oven, hob, microwave, dishwasher, and an electric kettle. The bathroom has a spa bath, shower, and a hairdryer. Bed linen and towels are provided. A washing machine is also available. Other shared facilities available include a games rooms and a sauna. 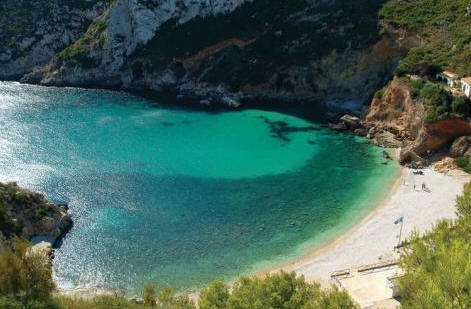 The closest beach at Cala el Pom is 5 minutes’ drive from Villas Bramms, and Javea Golf Club is 11 km away. Montgó Nature Reserve is a 30-minute drive from the property, and Alicante Airport is 100 km away. Our area is known as the orange blossom coast with the vast fertile citrus groves of oranges and lemons. To the south of Javea there are hidden beaches and coves to explore. Such as the Cala Blanca and Ganadella also Ambola which is a nudist beach. If you are feeling energetic you could have a walk in the Montgo national park the landmark of Javea. At the summit of 753 metres you have stunning 360 degree views you can even sea Ibiza to the East. A short drive away you can explore the winding streets of the Jalon and Orba valleys with the typically Spanish white washed houses. You could sample the locally produced wines including the famous Moscatel at the local bodegas. This is without doubt the real Spain!! The Costa Blanca is a very popular region with visitors. Miles of award winning soft white sandy beaches shelving gently into the Mediterranean this makes a good choice for children. Benidorm is an excellent choice for wonderful sandy beaches and vibrant night life. There is an Aquapark nearby Terra Mitica and for a night out visit Benidorm Palace. Javea golf course is on the doorstep but only a short drive away you will find La Sella and Oliva Nova golf courses. A 20 minute drive away is El Vergal safari park a good day out for any age, in the same area visit the Spanish towns of Pego, Oliva and Gandia. The area is steeped in History relax and be a part of the Spanish way of life if only for a short while. Trains run between Valencia and Gandia, or a one hour drive will take you to Valencia the region’s capital. This stunning city is a must to visit, whether it be museums or the oceanographic or just shop till you drop ( into the nearest tapas bar!!) Well you have to experience the Spanish way of life!! What more could you want literally 30 seconds to the beach. Arenal beach is a shell shaped bay with golden sands ideal for families, and visitors of all ages. It is the most popular beach in Javea. With it´s shell shaped bay, golden sands and shallow clear water, There is something for everybody. Swings, climbing frames,and slides for the children, volley ball nets and water sports for the energetic, laze in the sunbed ,or stroll along the promenade. On a summer evening you can search out a bargain at the many craft stalls along the promenade or chill out in one of the many trendy bars and restaurants and watch the world go by. There are many excellent bars, restaurants and shops all on your doorstep. 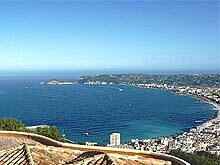 Javea is without doubt one of the prettiest resorts on the Costa Blanca. The great variety of landscapes and a mild climate makes it an ideal destination for year round holidays. 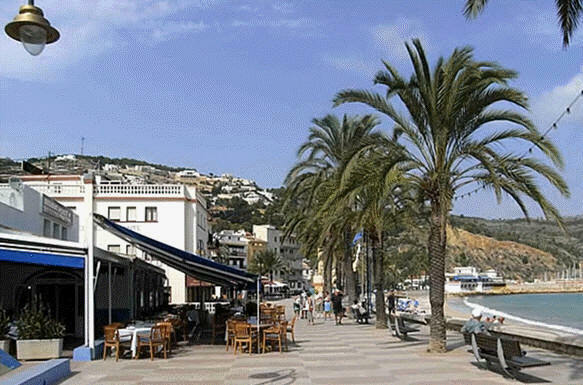 Javea is made up of 3 centres.the Marina, old town and the livelier Arenal playa. From the port and marina you can walk down to buy freshly caught fish from the¨Aduanos del mar¨ or fisherman´s quarter. Enjoy an excellent meal or tapas in the many restaurants, bars and cafes have a stroll around the many shops.